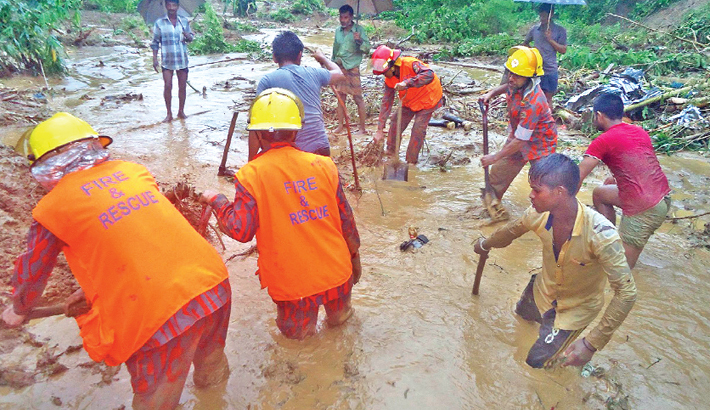 CHITTAGONG: At least 133 people, including four soldiers, were killed and several hundreds injured as torrential rains triggered massive landslides in three hill districts of the country on Tuesday. Police said rescue teams have so far recovered 133 bodies. Many were still trapped inside their landslide-hit homes on hillsides. Deputy Commissioner Manzarul Mannan said that 98 people were killed in Rangamati, 29 in Chittagong and six in Bandarban. The casualties were caused in mudslides, lightning strikes and wall and tree collapses, he added. “Rescue operations are going on in full swing. The death toll may rise further,” he told the daily sun. The latest disaster came two weeks after a super cyclone battered the same areas, killing eight people and damaging thousands of homes. The government allocated Tk 12 lakh and 500 tonnes of rice to the landslide-affected areas. President Abdul Hamid and Prime Minister Sheikh Hasina expressed deep shock at the loss of life in the disaster. Local administration said mudslides, heavy rains and tornado caused havoc on the hill districts, burying many dwellings, when the dwellers were sleeping at night. Three young children from the same family were among those killed in the disaster in Rangamati. Many of the victims were from poor tribal communities in the remote hill district. “Some of them were sleeping in their houses on hillsides when landslides occurred during incessant rain,” police officer Sayed Tariqul Hasan said. The four soldiers, who were sent to clear roads hit by landslides in Manikchhari town in Rangamati, were killed as mud collapsed on them from a hill. The death toll might rise as many remote areas still remained cut off due to the catastrophe, said an official of Disaster Management Department. “We’ve evacuated some of the affected villagers to schools and other safe places,” a police officer said. Twenty-two of the deceased were identified as Nuria Akter, Ayus Mallik, Ruma Akter, Amit Chakma, Hazera Begum, Liton Mallik, Chumki Das, Sonali Chakma, Niki Marma, Anuching Marma, Mahi Akter, Mothao Thiang, Mao Thiang, Theo Chap Thiang, Tripura, Shuva Barua, Mithu Barua and Lata Barua. Rangunia Upazila Nirbahi Officer (UNO) Mohammad Kamal Hossain said six people went missing at Islampur and Raza Nagar. Army troops, fire-fighters, law enforcers were carrying out rescue operations in the districts, sources said. Road communications of Chittagong with Rangamati, Cox’s Bazar and Bandarban were snapped as many points of roads were inundated by monsoon rain. Chittagong Port Authority (CPA) and Chittagong City Corporation started removing embankment from Mosheshkhal in the afternoon to reduce water-logging. Heavy rains also pounded Dhaka and Chittagong, causing severe water-logging in many places and disrupting traffic for hours. Nearly 200 homes and other establishments were damaged and many electric poles and trees uprooted by a tornado in Chittagong in the early morning.